The Bashkirs, a Turkic people, live in Russia, mostly in the Central Asian republic of Bashkortostan, an oil rich territory. A significant number of Bashkirs also live in the republic of Tatarstan, as well as in Perm Krai and Chelyabinsk, Orenburg, Kurgan, Sverdlovsk, Samara, and Saratov Oblasts of Russia. To trace the story of this largely (60 percent) Muslim people is to trace the story of how, over many centuries, a people and a culture developed an identity and a sense of nationhood that eventually found expression in what the first political entity to reflect their name, Bashkortostran, in 1917. This process appears to have started sometime in the tenth century, when an Arab writer describes the Bashkirs as a war-like and idolatrous people. It was about then that Bashkirs started to convert to Islam. In the thirteenth century, they were incorporated into the great Mongol Empire and in the fifteenth century they were ruled by the Khanate of Kazan. When that polity collapsed in 1552, they found themselves under Russian rule. After the Bolshevik Revolution of 1917, the Soviet Socialist Republic of Bashkortostran was the first to be granted autonomy (in 1919). The Republic continues within the Russian Federation as a democratic, sovereign state although there has been tension between its regional identity, and the role of the greater Russian polity. Some see the Federation as a continuation of an imperial policy elevating the rights of the center over those of the periphery, denying regions’ legitimate aspiration to become independent states. Bashkirs are concentrated on the slopes and confines of the southern Ural Mountains and the neighboring plains. They speak the Kypchak-based Bashkir language, a close relative of the Tatar language. Most Bashkirs also speak Russian: some as a second language, and some as their first language, regarding Bashkir as a language spoken by their grandparents. 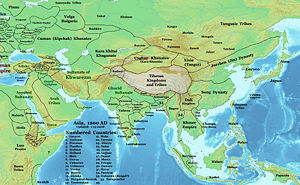 Asia in 1200 C.E., showing the location of the Bashkirs and their neighbors. European sources first mention the Bashkirs in the works of Joannes de Plano Carpini and William of Rubruquis. These travelers, who fell in with Bashkir tribes in the upper parts of the Ural River, called them Pascatir, and asserted that they spoke the same language as the Hungarians. Until the arrival of the Mongols in the middle of the thirteenth century, the Bashkirs formed a strong and independent people, troublesome to their neighbors, the Volga Bulgarians and the Petchenegs. By the time of the downfall of the Khanate of Kazan (from 1438) in 1552 they had become a weak state. In 1556 they recognized Russian sovereignty. The Russians founded the city of Ufa in 1574 to defend them from the Kyrgyz (who now live mainly in the State of Kyrgyzstan), and subjected the Bashkirs to a fur-tax to pay for this. Russia may have pledged to protect the Bashkirs but in effect this was imperial expansion into the South Urals. This created considerable unrest among the population, and led to a series of revolts. The beginning of a specific nationalist consciousness may date from these revolts. In 1676, the Bashkirs rebelled under a leader named Seit, and the Russians had great difficulties in pacifying them. Bashkiria rose again in 1707, under Aldar and Kûsyom, on account of ill-treatment by the Russian officials. The third and last insurrection occurred in 1735, at the time of the foundation of Orenburg, and it lasted for six years. In 1774 Bashkiria supported Pugachev's rebellion. Yemelyan Pugachev was a Cossack who declared himself to be the true Tsar of Russia and led a revolt in 1773-4. Bashkir troops fought under the Bashkir noble Salawat Yulayev, but suffered defeat. In 1786, the Bashkirs achieved tax-free status; and in 1798 Russia formed an irregular Bashkir army from among them. Residual land ownership disputes continued. 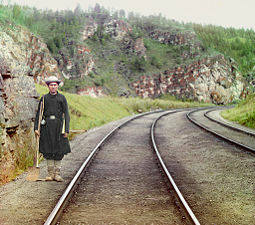 Bashkir switchman near the town Ust-Katav on the Yuryuzan River between Ufa and Cheliabinsk in the Ural Mountain region, ca. 1910. From the tenth century and during the Khanate of Kazan, many Bashkirs converted to Islam. Most are Sunni and follow the Hanafi legal school, which predominates in South and South East Asia. In the period between the sixteenth and eighteenth century, some Muslims were compelled to convert to Christianity but in the nineteenth century there was a movement back to Islam. In 1788 Catherine the Great established the "Orenburg Mohammedan Spiritual Assembly," which was the first Muslim administrative center in Russia. Russian regions. Bashkortostan is No 2 (Green) under “republics”. In 1865, the Russian government formed a governorate in the region, with its capital at Ufa. Although the name of this administrative unit did not refer to the Bashkirs, it can be identified as the first step in the process that eventually led to the formation of the Republic of Bashkortostan. After the 1917 Russian Revolution, the region became an Autonomous Soviet Republic in 1919. This became the Republic of within the Russian Federation in 1992. In 1937, it was declared a “state.” Beginning in the early twentieth century, a nationalist and Muslim movement had developed among the Bahskirs. As this sense of identity developed, many Bashkirs began to call for a state of their own. Their area was one of the main theaters in the war between the Bolsheviks and the White Russians. Both sides attracted Bashkir support, as they sought allies to assist their own national aspirations. This meant that whichever side won, the Bashkirs could expect a favorable response to their aspirations for autonomy. When the Bolsheviks emerged victorious, they named Bashkir as the first autonomous Soviet Republic within the new political system (1919). In 1990, the republic declared independence but this did not attract any recognition by any other state. When the Russian Federation was formed, the republic was a signatory to the treaty of March 32, 1992, which created the Federation. It exists as a sovereign state within the Federation, with some powers vested in the larger polity most significantly inter national relations and defense. 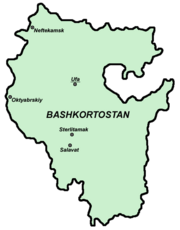 One third of the population of Baskkortostan is Bashkiri. In 1995, Parliamentary elections were held. There is some tension between the aspirations of the Bashkirs for their own state and their relations with Moscow. For example, in 2000 Bashkirs appealed to the High Court to retain reference to their national identity in their Russian passports. Unlike Chechnya to the South, however, the Bashkirs have not resorted to armed resistance to further their national aspirations. Some Bashkirs traditionally practiced agriculture, cattle-rearing and bee-keeping. The nomadic Bashkirs wandered either the mountains or the steppes, herding cattle. Until the nineteenth century, most Bashkirs continued to farm and to herd. It was not until the nineteenth century that, encouraged by the Russians, urbanization began. This was led by Russian settlers. Villages traditionally played an important role in Baskkir life. People identified strongly with their village and regarded this as the main social unit. This has continued into the modern period. Bashkir national dishes include a kind of gruel called yûryu, and a cheese named skûrt. ↑ Republic of Bashkortostan Kommersant. Retrieved May 21, 2008. ↑ 2000, "THE NEWS OF THE WEEK - The Russian Federation - Nationalities - Bashkirs to High Court: We Want to Retain Ethnic Identification in Passport," The Current Digest of the Post-Soviet Press 52:37:13, ISSN 1067-7542. Crews, R. 2003. "Christian Noack, Muslim Nationalism in the Russian Empire: Nation-Building and National Movements among the Tatars and Bashkirs, 1861-1917." KRITIKA -BLOOMINGTON. 4:444-450. ISSN 1531-023X. Giovanni, and Avezac de Castera-Macaya. 1839. Relation des Mongols ou Tartares. Paris, FR: Arthus-Bertrand. This page was last modified on 13 May 2016, at 21:08.